The Shenango River affected our family in two major ways, one bad, one good. The bad time was in the spring of 1948 when the river rose high enough to surround our little frame house on Third Street in Wheatland, Pennsylvania, with several feet of murky water. It was enough of a disruption in our daily lives that Mom and Dad moved to a house on higher ground a block away. Then there were the good times our family had when we camped along the western side of the Pymatuning Reservoir, a 16-mile-long serpent-shaped reservoir of water that straddles the border between western Pennsylvania and Ohio. It was formed by a dam built in 1933 to control the errant waters of the Shenango and Beaver rivers. Not that the dam held back regular flooding in the areas of Wheatland or Sharon. It wasn’t until the 1970s when the Sharpsville Dam was built and put a stop to that. 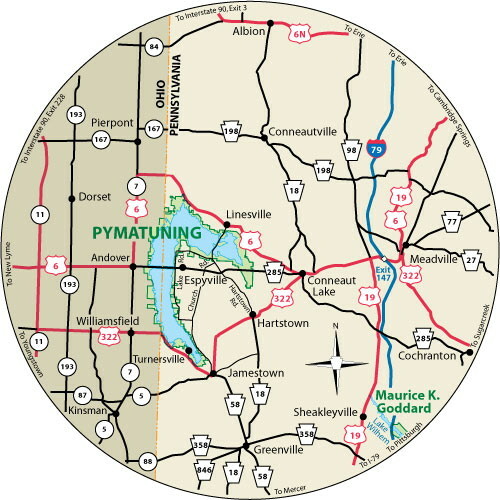 Today, Pymatuning State Park provides programs and exhibits at the Wildlife Learning Center and a nature trail for visitors to enjoy. But the park had no such amenities in the 1950s, during the early period of the state park’s development. In those days, we often drove the approximately 20 miles on country roads from our home in Sharpsville, passing through Greenville and Jamestown, for Sunday picnics at the park. We took visitors to the spillway near Linesville, Ohio, to feed the carp. We would stand on the causeway bridge to watch what we thought was a remarkable sight: The carp were so numerous in their wide-mouthed feeding frenzy that the ducks would walk on their backs to compete for the pieces of stale bread visitors threw into the water. It was in July 1953 when we began setting up tents at Pymatuning Campgrounds. The Korean War had just ended, the Cold War was continuing, and Dwight David Eisenhower had been recently elected to the U.S. presidency. Newspapers and radio programs informed us of these and other events at the time, but our focus was on our quiet daily lives in our small corner of the world. Camping was originally Dad’s idea, but much of the preparation was on Mom’s shoulders as she packed food, clothing, cooking equipment, and whatever else she could predict our group would need. When our light blue 1949 Ford pickup truck was loaded with everything, we probably resembled Okies from the Dust Bowl years. Since there were five of us — Mom and Dad, Mike (age 11 in 1953), my baby brother Pat (age 4), and me (age 13), Dad surely made more than one trip to move everyone and everything. I don’t know which of today’s three campgrounds was the one we used in the 1950s, but I do remember that it was primitive. When we first arrived at the campgrounds, Dad emphatically stated, “The only way to have a genuine camping experience is to cut our own space out of the brush and trees.” And, using a saw and an ax, he did just that. We kids weren’t much help. We were more interested in running down to the lake and jumping into its cool water. In Mom and Dad’s thinking, it was only appropriate the campground had no electricity, phone, television, or flush toilets. (I don’t know whether the campgrounds provided shower facilities, but I do recall washing at hand pumps and in the lake.) Our parents liked to prove to themselves that they could survive any hardship. And so far, after coming of age during the Great Depression, enduring the impact on their lives by World War II, and starting from post-war scratch in Wheatland, they had done relatively well. Also, I think they were reacting against the rampant consumerism of the 1950s and wanted us children to know and appreciate the difference between having all the comforts of life and privation. At Pymatuning, however, we kids were so busy enjoying our playground we paid little attention to most discomforts. It’s a good thing the park officials eventually designated specific spaces for tenting or the whole area would have been denuded as camping grew popular. In fact, the park’s campgrounds have many restrictions in place: no tree-cutting, no alcohol, no pets, fires only in provided fireplaces. The plan was that Dad would stay at home on weekdays to work at The Sharon Herald newspaper plant during the daytime and at his print shop and Angel’s Casino in the evenings, then join us on weekends. Sometimes, after a week or so at camp, we would ride home with Dad for a day to shower, wash clothes and help at the record hop, then return for another week. Once a week, a park ranger would walk around the grounds collecting fees from the campers. It was a tradition to put the required few dollars in a glass Mason or mayonnaise jar and hang it from a tree or tent pole where the ranger could find it whether any of us were around or not. 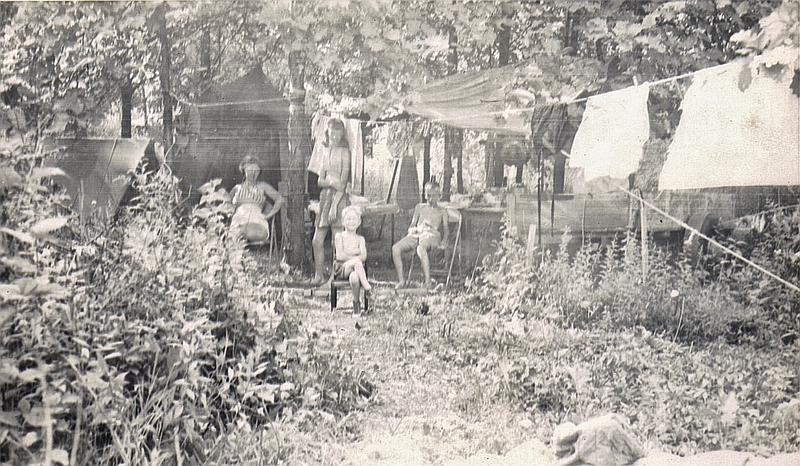 The Angels at Pymatuning Campgrounds near Jamestown, PA, 1953. Left to right: Susie, Ann, Patrick, Michael. One of the few concessions to civilized life was a little store on the campgrounds we called the “trading post.” Since Dad was at work during the week, we had no transportation or any way to communicate with him, so we depended on this store for camping and fishing supplies, food, ice, and firewood. When Mom sent us to the store to purchase an entree for the evening meal, we would return with the requested pork chops, hamburger, or steak selling at a price of 49 cents a pound. These cuts were not wrapped in the usual butcher paper but coated with a glossy layer of paraffin wax that Mom would peel off before grilling the meat on the campfire. The best parts of our days at camp were eating and swimming. Mom was often working over a hot fire pit instead of a hot stove, but she seemed to enjoy our outdoor living as much as we did, perhaps because it was an escape from cleaning house and assisting Dad in the print shop and dance hall. She was an expert at jerry-rigging a little kitchen out of stumps and boards for work surfaces, scavenging rocks and twigs for the fire place, and devising a cooktop out of a sheet of metal. There are two things about eating out-of-doors: One’s appetite is felt more acutely and food smells and tastes extra delicious. My favorite was a potato baked in the glowing embers of a dying fire. After about an hour in the fire, the potato would form a thick black crust that gave it a smoky taste. At this point, I would dig it out of the coals with a stick, slice it open, and slather melting butter on the steaming halves. Roasting marshmallows on sticks was popular with the others, but I would have nothing to do with those gooey, overly sweet, tongue-burning little white cubes blackened by the flames. Hotdogs were much more to my taste. I haven’t eaten one in years, but my mouth still waters as I recall wrapping a bun around a juicy roasted frankfurter, pulling it off the stick, then dousing it with mustard, catsup, and sweet pickle relish to create a partly-burnt, sweet-spicy concoction for my eating pleasure. Each evening after sunset our family and assorted friends, relatives, and neighboring campers would sit on makeshift benches around the fire pit, dodge the eye-stinging smoke, and watch the wood slowly burn down to a pile of hot ashes as we told amusing stories, playfully bantered with each other, and sang the usual camp songs as Mom cooked us a batch of popcorn over the coals. Wow, the freedom to jump into the lake whenever we wanted during the hottest months of the summer was the equivalent of being in heaven! The beach of trucked-in beige-colored sand was within a short walk from our tent, making it easy to go swimming, return to campsite to eat lunch, then swim again. And swim again after the sun went down. Among my happiest memories are those of lying on the beach in the dark, listening to the water lap against the shore, studying the sky full of stars and contemplating the vastness of the universe. The sounds of swimmers talking and splashing in the water seemed different to me at night, sort of contained, as if I were enclosed in a soundproof room. A small island visible from the shoreline seemed to beckon to my brother and his buddy until one day they finally gathered enough courage to try to swim to it. Whether they reached their destination or not is lost to memory, and I’m not sure whether my parents were ever told of their daring venture. One summer Dad had somehow acquired several huge inner tubes that we would stack up and use as a platform for jumping into the water or use to lie across as we lazily rode the gentle waves. Those were the only water toys we had, but we didn’t require much equipment to have fun in the water. Exposing our fair skin to hours of the sun’s rays wasn’t very smart at a time when we didn’t use sunscreen. Coppertone was about the only suntan lotion available and I probably used it at one time or another but I didn’t like its greasy feeling. In any case, sun lotion certainly wasn’t used during our Pymatuning days and the result was a bad case of sunburn after the first day or two. My face, arms, and back were so painful, I couldn’t sleep at night and had to hold off swimming until I healed. Besides sunburns, I wrote in my diary about other downsides of camping as well, such as having almost “froze to death” one night, discovering that our tent leaked during a downpour another night, quarreling with each other and our visiting cousins, and enduring noisy neighbors and the dusty gravel roads. However, those adverse events were easy to dismiss when we could play all day, eat and sing together in the evenings, fall asleep to the sound of crickets and frogs at night, and wake in the morning to a symphony of bird songs. Occasionally, Mom and Mike would go fishing at the lake and bring back carp to fry over the campfire. The first time Mike caught a fish, he proudly brought it back to the campsite to show the family. I felt so sorry for it as it flapped on the ground that Mike reluctantly returned it to the lake to live out its life in its natural habitat. To this day, I have regretted that I caused Mike to give up his very first catch. Evidently, I had mixed feelings about breaking camp, but I can imagine that clean clothes and a warm shower made it worth returning home. It would take all day for Dad to move our accumulation of camping supplies back to Sharpsville. Before I left home for college, our family had spent three summers at Pymatuning, from 1953 through 1955. To this day, the smell of wood smoke and sounds of kids splashing in water take me back to those times when we would laugh and tease and sing together. Our Pymatuning days allowed us to shed the stresses of life at home, at work, and in school. In that rustic setting, we learned to live minimally and in the moment, to be attuned to our natural surroundings, and most importantly, to sit back and soak up the joys of being with family and friends. Ann Angel Eberhardt, Goodyear, AZ, April 2013. Many who lived in Sharpsville, Pennsylvania, in the 1950s and ’60s longingly recall this delicious coffee-flavored soda/milkshake. It was sold at Crick’s Rexall Pharmacy, which was touted in ads as the “Home of the Famous Coffee Stir.” The drug store had not only the usual health-related offerings stored in tall wooden cupboards with glass-paneled doors, but a popular soda fountain, complete with several wrought iron cafe-style tables and chairs (including one miniature set for little children). As a group of two or three rambunctious teenagers, we would often meet there to annoy the soda jerk and order coffee stirs or cherry phosphates and one 25-cent bag of Wise’s salty, oily, crunchy potato chips which we split among us. Mary Claire Mahaney, author and artist, is the granddaughter of former longtime burgess of Sharpsville and haberdashery owner, George D. Mahaney. In the early 2000s, she wrote several essays about her memories of the Sharpsville area for The Herald newspaper, which can be read on her website. One of Mary Claire’s articles, “Stirring Memories,” dated November 26, 2004, records the origin of the coffee stir, its ingredients, its popularity through the years, and how pleasurable it was. …The taste and smell and coldness of that drink were heavenly; it was sweet and bitter and heavy and light, and the wonder of it was that it could be all those things at once. More about the early years of the coffee stir and variations of the following recipe can be found at the Sharpsville Area Historical Society site. (Also see the Society’s July 2017 Newsletter). According to Ralph C. Mehler (SHS Class of 1980, board member of the Society and owner of Mehler Insurance on East Shenango Street), Crick’s Pharmacy was across Mercer Avenue from Reichard’s Pharmacy. …[M]y great-grandmother Emma Knapp Mehler was the sister of Gert Knapp Reichard, so we consider the coffee stir to be somewhat of a family recipe. The recipe card [displayed at the Historical Society website] is in the hands of my grandmother, Regina Erb Mehler, and my father confirms that was how it was made with the egg and all. The following Coffee Stir recipe, although not the original, comes somewhat close to the real thing, more so if one uses high-fat ice cream! – Ann Angel Eberhardt (SHS 1958), Goodyear, AZ, May 2014. 1. Bring water to boiling. 2. Add coffee and stir until dissolved. 3. Add sugar and stir until dissolved. 5. Add syrup & vanilla. 6. Add 4 Tablespoons of this mixture to a blender. 7. Add soda water and ice cream. Blend and enjoy! Source: This recipe was shared with Mike Angel (SHS 1960) by a former Sharpsville High School classmate and friend.